John 1:1 and the Coptic Versions: John 1:1c: The Word was "a god"? John 1:1c: The Word was "a god"? 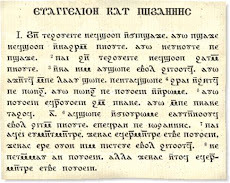 It is becoming well-known that the primary Coptic translations of John 1:1c – the Sahidic, the proto-Bohairic, and the Bohairic – do not render it "the Word was God," as is common in many English versions, but "the Word was a god," a rendition also found notably in the New World Translation of the Holy Scriptures. The significance of this is remarkable. First, the Coptic versions precede the New World Translation by some 1,700 years, and are part of the corpus of ancient textual witnesses to the Gospel of John. Second, the Coptic versions were produced at a time when the Koine Greek of the Christian Greek Scriptures was still a living language whose finer nuances could be understood by the Coptic translators. Third, the Coptic versions do not show the influence of later interpretations of Christology fostered by the church councils of the 4th and 5th centuries CE. The Greek text of John 1:1c says, KAI QEOS HN hO LOGOS, an anarthrous pre-verbal construction that can be literally rendered as, "and a god was the Word." an indefinite construction that literally says "and a god was the Word." Coptic grammarians agree that this is what the Coptic says literally. But the theological presuppositions of certain grammarians do not allow them to be satisfied with that reading. Just as they attempt to do with the Greek text of John 1:1c, certain scholars seek to modify the clear impact of "a god was the Word." But whereas the Greek text allows for some ambiguity in an anarthrous construction, the Coptic text does not allow for the same ambiguity in an indefinite construction. Unlike Koine Greek, Coptic has not only the definite article, but the indefinite article also. Or, a Coptic noun may stand without any article, in the "zero article" construction. Thus, in Coptic we may find : pnoute , "the god," ounoute, "a god," or noute, "god." Given these clear choices, it cannot but be highly relevant to their understanding of the meaning of John 1:1c that the Coptic translators of the Greek text chose to employ the Coptic indefinite article in their translation of it. Were the Coptic translators looking at John 1:1c qualitatively, as has been suggested by some scholars in their analysis of the Greek text? That is not the literal reading, a qualitative rendering would be a paraphrase. Only in the sense that a god is also "divine" can an English translation on the order of "the Word was divine" be glossed from the Coptic text. The Coptic evidence is significant given the fact that Bible scholars have roundly chastised the New World Translation for its supposedly "innovative" rendering, "the Word was a god" at John 1:1c. But this very way of understanding the Greek text of John 1:1c now proves to be, not new, but ancient, the same translation of it as given at a time when people still spoke the Greek that John used in composing his Gospel. No. Although the Coptic translators use the definite article at John 1:18 in identifying the Word, this use is demonstrative and anaphoric, referring back to the individual , "the one who" is previously identified as "a god" in the introduction. Thus, John 1:18 identifies the Word specifically not as"God," but as "the god" previously mentioned who was "with" ("in the presence of," Coptic: nnaHrm) God. This god, who has an intimate association with his Father, is contrasted with his Father, the God no one has ever seen. A literal translation of the Coptic of John 1:18 is "No one has ever seen God at all. The god [who is] the only Son in the bosom of his Father is the one who has explained him." Being closer in time to the original writings of the apostle John, and crafted at a time when Koine Greek was still spoken, the Coptic evidence weighs heavily in the direction of those who see in the Gospels a Jesus who is not God, but the Son of God, a divine being who is "the image of the invisible God," but not that Invisible God himself. This one is the Representative of his Father, who declared the Good News of salvation to mankind, and sanctified his Father’s Name.